Often I find that some of my favorite photographs are those I never intended to get in the first place. I think my favorite picture from the Hawaiian trip might just be one of them. I was down on one of the black sand beaches, and the winds were so strong they were almost blowing the waves apart across the rocks. The water raced across the ragged, volcanic, rocks. It was an impressive display of the sea's power. I was hunched down behind a rock, using it as wind break, while trying to capture the weather (which proved hard). As I was sat there, looking through my viewfinder, three kids appeared. They clambered enthusiastically across my view, probably faster than their parents would have been happy with. I snapped the picture above. Something about it appeals to me. The energy and fearlessness of the kids, the sea raging behind. 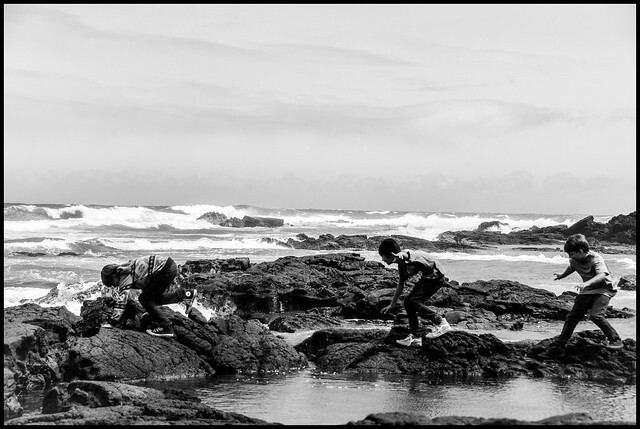 Even the composition worked almost accidentally as the children navigated the rocks. It reminded me of the simple pleasure of childhood exploration and adventure. Maybe it's just because I loved clambering across rocks as a kid myself. I'm prone to the creative cliche of always disliking my own work, but this picture? This picture I like.